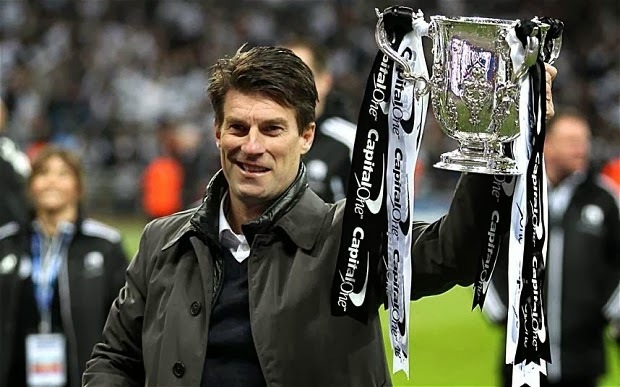 Michael Laudrup has broken his silence after his surprise sacking at Swansea City. After leading the club to a ninth-placed finish in the Premier League and victory in the League Cup last season, the Dane was shown the door. Here, he declares his consternation at losing his job. ‘I am deeply disappointed to have been dismissed as manager of Swansea City. In particular, the manner in which it happened and the actions the club has taken since notifying me in the briefest of letters which gave no reasons why such hasty and final action was deemed necessary. I am, of course taking legal advice and the LMA have already written to the club asking for a proper explanation as to why I was summarily dismissed. Until we receive the response I am unable to say any more about the termination but I do want to take this early opportunity to thank the Swansea City fans for their continued support and say it has been an honour to manage this great football club. ‘I have thoroughly enjoyed my time managing in the Barclays Premier League which I consider to be the one of the best leagues in world football. I leave the club proud of our collective achievements over the past 20 months and I believe we have continued the club’s progression in the manner of my predecessors including Roberto Martinez and Brendan Rodgers. ‘Of course the obvious highlight during my time in charge was leading Swansea to the first major trophy in the club’s history in winning the Capital One Cup at Wembley resulting in European qualification. In addition, our 9th place in the Barclays Premier League was our highest finish in 31 years and the second highest in the club's 102-year history which again is something which fills me with pride. This season we have all enjoyed the memorable journey in the Europa League where the team will soon to face Napoli in the last 32 of the competition. The club has informed me that I cannot visit the training ground to say my farewells to the players so I do that now through this statement. The players have been fantastic and their contribution under the very professional guidance of my coaching staff has been absolutely fundamental to the club’s recent successes. Three members of my staff have also been dismissed. ‘Whilst league results have been disappointing of late, we are still 12th in the table and it is there for all to see the fine margins in the league this season in terms of points that separate 11 clubs. Although we have been unfortunate with injuries, I believe our league form would have improved and that we would have benefited from the forthcoming Europa League and FA Cup matches.